If you have become paralyzed after a workplace accident, you may feel totally helpless and like you have lost your independence. While there is no cure at present for paralysis, you should not give up the hope of resuming a fulfilling life. The goal of treatment for your paralysis is to help you adapt to your life with paralysis and to gain as much independence as possible. Assistive tools and technology can play a huge role in this. However, they can be expensive. Fortunately, you may be entitled to compensation for these costs as part of your workers’ compensation award. Manual wheelchairs. People who have upper body strength will often use manual wheelchairs to get exercise. Unlike those in the past, newer manual chairs are lightweight and easier to use, push, and get in and out of vehicles. Powered wheelchairs and scooters. For paralysis victims who cannot use a manual wheelchair, motorized wheelchairs powered by batteries are a good option. Motorized scooters may be preferred by people who do not need to use a wheelchair full time. Power-assist wheelchairs. These are a hybrid of the manual wheelchair where a small, powerful motor is attached to a chair wheel or the base of chair. When activated, it can give the chair a strong boost with a forward push on the hand rim. Standing wheelchairs. Standing wheelchairs operate like manual ones, but also allow a person to stand. Some chairs come with power assist to help the person rise. What Are Home Modifications You Could Need? Ramps. 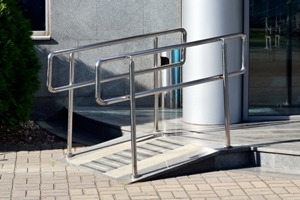 Wheelchair ramps are essential to allow you to move in and out of your home. Larger doors. If your doors are not wide enough to accommodate your wheelchair, they may need to be replaced with wider doorways to allow you to navigate in your home. Environmental controls. An environmental control unit can allow you operate a number of switches and appliances—like opening a door, turning on your television, using the telephone, and adjusting your lights. They are operated by use of switches, voice commands, computer, or sip and puff. Other modifications. Grab bars and doorknobs that are easy to turn can be simple modifications that can make your life easier. Other modifications could be needed to your shower, sinks, and other appliances to allow you to use them. A home elevator or stair lift could be helpful if you need to navigate stairs. These are just a few of the modifications that could enable you to perform some of your day-to-day activities independently. Can You Use a Computer If You Are Paralyzed? Computers are vital to almost everyone’s day-to-day life and necessary in many jobs. Fortunately, technology allows paralysis victims who have little or no use of their upper bodies to independently use a computer. A number of systems are available that allow people to fully utilize their computers through the use of their eyes, voice, head, or breath. These are just some of the mobility aids and technology available to give you a better quality of life. The Christopher and Dana Reeve Foundation has a wealth of information on these and other resources so that you can learn more about your options and where to purchase what you need. If you have become paralyzed after a workplace accident, the medical treatments, assistive tools, and home modifications you will need to maintain your independence can be expensive, making the value of your workers’ compensation claim significantly higher. However, this can also increase the likelihood that your employer’s insurance company will fight even harder to avoid paying you the benefits you deserve. Manfred Ricciardelli has over 20 years of experience helping employees fight to obtain the workers’ comp benefits they were entitled to. Start an online chat or fill out our online form today to schedule your free consultation to learn how he can assist you.